Giddy-up partner! We got varmints out yonder! 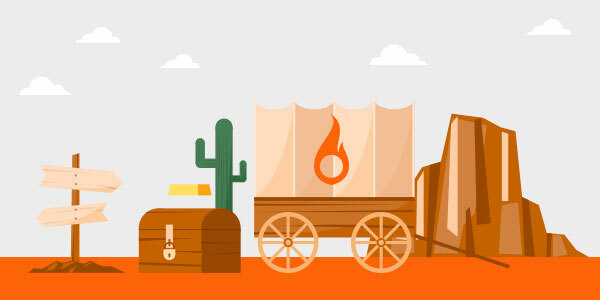 Just kidding… but in all seriousness, bounce codes are a little like the wild west. They’re uncertain, fraught with danger, and should be approached with healthy amounts of respect and caution. Transient bounces (also known as soft bounces) are defined as temporary failures or conditions that once they change will allow for the delivery of the message. There’s a numeric code that is attached, or used to define the temporary failure. We refer to this code as a 4.x.x (the x’s are variables). Permanent failures (also known as hard bounces) are just that, permanent failures that will prevent the message from being delivered to the intended recipient. These bounces are classified with a 5.x.x (again the x’s are variables). In addition to these numeric designations, extended descriptors shed more light on why messages aren’t being delivered. Email admins review these text strings, and their corresponding bounce codes to determine where problems occur – either on the sender’s side or the receiver’s. With this information in hand, an email admin makes the necessary changes on their end and can “be the town’s sheriff”. Ultimately affecting positive change, and altering the disposition of the message from bouncing to placement in the inbox. However, we don’t live in that world. I wish we did, but we don’t. 550-5.7.1 Spammer go die! No seriously, take a long walk off a short pier! Imagine, every domain has their own set of unique bounce codes and extended descriptions that don’t conform to the simple binary construction defined by RFC. Well you don’t have to imagine it, that’s about the state of bounces all over the world… *deep deep sigh* it’ll be ok. Unfortunately for you and me, the world isn’t a neat place where everything is black and white. There isn’t really a universal agreement on what a permanent vs. temporary failure code means. Although a 5.x.x should be ‘user doesn’t exist’ or ‘domain name doesn’t exist’ etc. that’s not always the case. Certain domains believe that if someone is blocked for spamming, or for including a URL (knowingly or otherwise) in the body of the email that’s on a URL blocklist, then that constitutes a permanent failure and will bounce it back with a 5.x.x. As a long time proponent and advocate of Best Common Practices around messaging, I can see how you might want to permanently fail a sender’s messages for spamming or looking like spam. However, in reality, one man’s spam is another man’s ham. Spammy messages or poorly targeted campaigns are rectifiable situations. Maybe you didn’t think about the implications of sending to people who haven’t received your email in years, so they ran up the spam complaints and your message went to junk or was blocked. These are things that happen on occasion, prompting work to resuscitate your reputation. This may require enlisting the help of deliverability experts like the ones that work here at SparkPost, but nonetheless, it’s resolvable. Again, the problem is that every ISP and mailbox provider does it differently. There’s no true consensus, despite the RFC, on what goes into an extended description, what constitutes a hard bounce vs. a soft bounce or how to go about remediating. Even the US Postal Service got into the SMTP error code game! Confused yet? Don’t worry, we have your back! Although these are just a few of the numerous flavors of error code out there, the domains in the list above represent a lot of mail boxes. If you’re industrious and efficient, you solve for the lowest hanging fruit first. You can do this in a few steps. First, tackle the biggest domains. Incorporate those rules and learn them. Then, adjust sending volume, speed and connection rates. These are all in response to the kinds of errors that are being spit back from the domain’s mailbox provider’s MTAs. This helps to achieve righteously high inbox placement. Rest assured SparkPost does all of this. Since 25% of the world’s legitimate and non-spam email traverses our software, we see a lot of email. As a matter of fact, we’ve been able to solve the bounce problem for more than the handful of domains I’ve listed above. SparkPost’s automated rule set, the Adaptive Email Network, employs over 3k rules that help us classify a vast majority of the bounces that currently exist in the wild. Here’s where your eyes might glaze over a bit. Bounces return in a couple of different ways. The most common is for the mail server to reject a message from a connecting IP and issue the bounce outright. This is called synchronous as it happens in synch with the conversation. A-synchronous bounces are what you and I see as users. You send an email to your uncle Joe but mis-type his address and receive an email back from Yahoo! saying the message cannot be delivered. The bounce email that you receive is sent back after the bounce, hence it doesn’t happen at the same time you try to deliver the email. The two different conditions change how and where you go looking for the bounces and your reaction to the situation. But nothing is quite so simple. Have you gotten that feeling? A-synchronous bounces can happen in bulk. They aren’t the most common of bounces as it’s more efficient to send synchronous bounces vs. burning up your back end cycles trying to deliver email and then sending email back in response, but they do happen. Senders of bulk email need to deal with this situation in addition to processing bounces handed to them directly by the connecting mail server. Wild west, remember?! Simply put, when you know what a bounce code means you can take the appropriate actions to ensure your reputation doesn’t suffer and you’re able to reach the inbox. For example: a 421 from Yahoo! is sometimes called a gray listing and the appropriate action is to pause sending for 4 hours and retry. The only way you know this is to capture the bounce, read its contents and then apply automation rules to ALL outbound email. This puts you in compliance with the domain’s stipulated guidelines. Like I said, we got your back! SparkPost’s vast rule set was built over 16 years of operation. Our deliverability team captures and evaluates the occasional bounce that we can’t classify, and then creates a rule to account for it in the future. Yep, we do that. Now do you believe me when I say we have your back? Bounces are messy. Knowing what to do with them is complicated and requires the experience and ability to scale appropriate responses in real-time. That’s what we do for our clients, which makes them incredibly successful. More of our clients’ wanted email reaches their customers’ inboxes, that’s the SparkPost advantage. Come check it out, or let us know about your bounce woes. We are happy to help you out. Small details like this is why I use SparkPost instead of trying to save a few dollars and deploy my own email server. Thanks for the feedback Mike, we love hearing from our customers! If you ever have questions, you can always ping us directly in our community slack channel. Really useful information here, and great to learn a little more of how Sparkpost works behind the scenes to improve the email experience for senders and receivers alike.